The couple named the dog Sparky because he’s like a sparkplug full of energy. Sparky was an instant hit with the Pikus’ other two rescue dogs, Shadow and Whitecloud. Mario Pikus is an award winning painter and sculptor, and Sparky loves his colorful, love filled, art filled life at their home. A month later, Mario and Rebecca learned of a teacup Chihuahua puppy abandoned in the desert and offered to foster her as well. Sparky was overjoyed with the arrival of another canine, and the two twirling joyous animals were the subject of dozens of entertaining videos. Leila Blue, the adorable teacup, had new horizons awaiting her. Rebecca’s son, an artist living in Germany, recently lost his dog. His mom, who was planning a trip to Berlin for his birthday, decided to include Leila Blue as a present. This pup is now the toast of Berlin. Back in California, spunky Sparky quickly got over his grief at Leila’s departure. He has a beautiful half acre estate on which to run around chasing his brother pups. The trio chase after the birds that flock to the grounds in the early morning, and run after tennis balls during their afternoon outing. They run with abandonment and joy, circling around the trees and around Mario’s sculptures that dot the landscape. 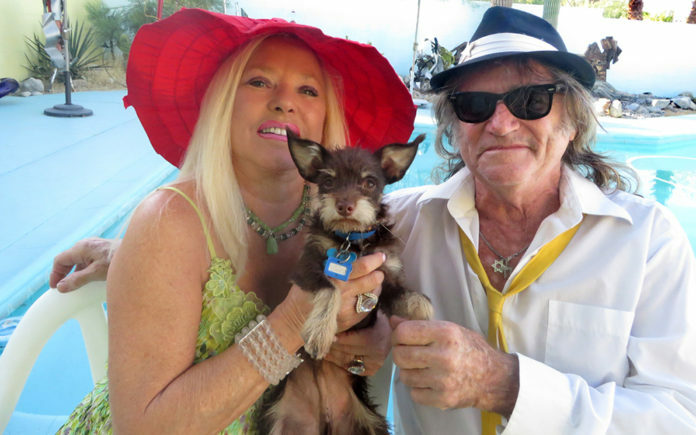 On November 18, 2017, Sparky’s humans were recipients of a Star on the Palm Springs Walk of Stars for their activism, humanitarianism, and promotion of the arts. If he could, Sparky would surely put his paw print in the cement proclaiming that Mario and Rebecca also deserve an award for their networking and support of homeless animals. Meanwhile, the dedicated team of volunteer networkers at the San Bernardino City Shelter, continue to photograph, videotape, and post animals like Sparky on Facebook and other social media sites. Social media has changed the world of shelter animals. Once hidden away from public eye, sequestered in shelters in industrial areas, their sweet, pleading faces are now easily viewed on phones and computer screens by potential adopters. Loving All Animals hopes that more folks will see adoptable animals on shelter websites, including the Coachella Valley Animal Campus (www.rcdas.org), and offer to foster or adopt them. You can view the animals at the San Bernardino City Shelter at www.petharbor.com and type in “San Bernardino” as the city. Won’t you open your heart and home and foster a sweet dog like Sparky? Contact Loving All Animals at (760)834-7000 if you would like to save a life through fostering. We don’t mind if you become “foster failures” like Mario and Rebecca Pikus.